A History Garden: The Mill Seat at Woodville - Vestiges of a "Liminal Village"
The Mill Seat at Woodville - Vestiges of a "Liminal Village"
One recently overcast day, I clambered over a guardrail and over a quite rickety foot bridge in Woodville, RI and took some up-close pictures of the former mill seat there. This site is on my list of southern Rhode Island's "liminal villages" -- communities that straddle the border of two towns separated by a river, usually centered on a textile mill. Like the mill villages at Potter Hill, Burdickville, Usquepaug, Bradford, Alton, and Kenyon, the textile mill was located in one town while much of the mill housing was built across the river in the other. In the case of Woodville, the mill seat and (what was likely) the local store, tavern, and owner's house was in Richmond (see below) while much of the worker's housing was in Hopkinton. Here are two photos I took of the mill seat late in the summer of 2007, when the Wood River was as low as I've ever seen it. On the right (or north) bank of the Wood River is Richmond; the left (or south) bank is Hopkinton. And yes, that is a goat grazing amongst the mill ruins all the way to the right. Some of the old gears are still plainly visible through the foliage in this photo from 2007 (below). Historically, these locales had been divided in the colonial era when the state of transportation made attending town meetings on the other side of swollen, icy rivers inconvenient and even dangerous. Colonial town records suggest that the bridges of the day were precarious and frequently damaged or destroyed in floods. These locations were often the seat for grist or snuff mills, and were only sparsely populated. Prior to King Phillip's War, Rhode Island's towns were quite large (see map at left, Rhode Island Town's, 1675). 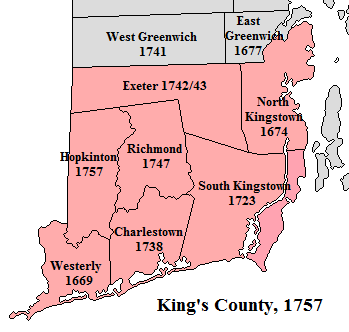 Kingstown for instance encompassed an area of 240 square miles, and originally consisted of the present-day towns of East Greenwich, West Greenwich, Exeter, Narragansett, North Kingstown and South Kingstown. 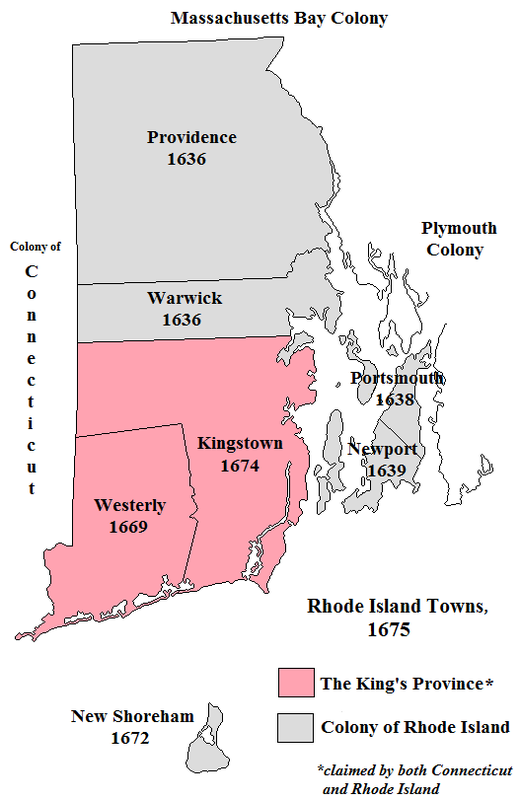 The white population, by contrast, was quite small; by 1670 Rhode Island's entire European population has been estimated at slightly over 2100. The majority of Rhode Islanders at that time lived in a handful of villages and settlements that hugged the coastline of the tiny colony. When Rhode Island finally held its first census in 1708, the number of residents had increased to to 7100; by 1730 that number had increased to 17,000 (see Census of Rhode Island, 1865). This procedure set the precedent for creating new towns from old in Rhode Island. Twenty years later, residents from the western section of North Kingstown as also complained that it was difficult to get to town meetings in Wickford; in March 1742/43 the General Assembly created the town of Exeter. Westerly was similarly carved up beginning in 1738. The eastern half of Westerly was divided into Charlestown at the Wood and Pawcatuck Rivers; a few years later the section of Charlestown north of the Pawcatuck petitioned to become Richmond when "evil minded men" from the plantation area along the coast "carried our meeting several miles from the center which we agreed upon" (Petitions to the General Assembly, Vol. VI, document 145). A decade later residents of northern Westerly petitioned to be divided at the Pawcatuck and became Hopkinton (which was separated from Richmond at the Wood River at what would become Woodville). The division of Westerly clearly illustrates the dilemma geographic barriers presented to remote members of the body politic. With the exception of the boundary between Westerly and Charlestown, every other division followed the contours of a river. West Greenwich was similarly formed by petition in 1741, though East Greenwich was a special case. In the aftermath of King Phillip's War, the General Assembly set aside the northern section of the King's Province "for the accomdatinge of soe many of the inhabitants of this Collony as stand in need of land” -- which became the town of East Greenwich. (Bartlett, Rhode Island Colony Records, Volume II, pages 587-88). Since Kingstown was not a functioning town at the time (despite it's creation by the General Assembly in 1674), no one from there complained when East Greenwich was removed from its jurisdiction. In 1729 when the Rhode Island's county judicial system was established, East Greenwich was made part of Providence County. In 1750 it became the county seat of the newly formed Kent County. 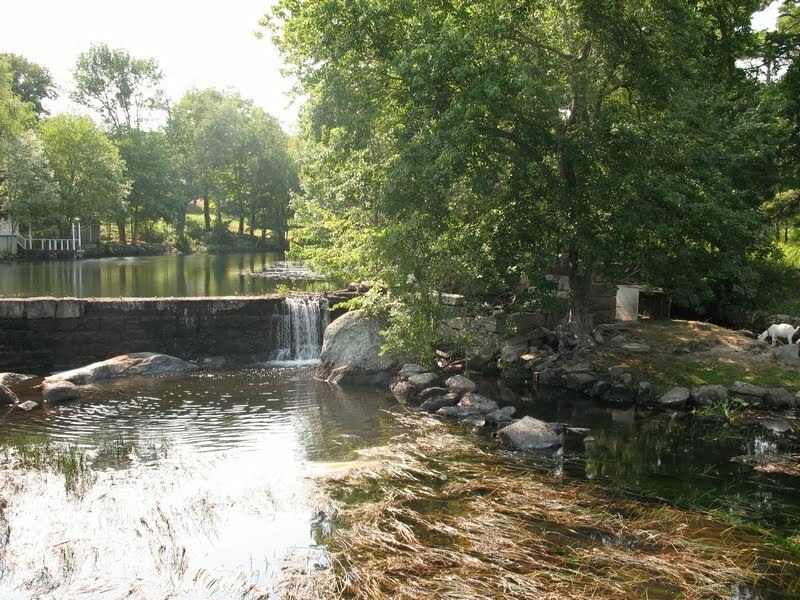 Later, in the early decades of the 19th century, the grist and snuff mills at these river crossings were bought out by local entrepreneurs to build the first water-powered textile mills. What factors went into deciding which town the mill proper was to be built? Why was most of the mill housing often built in the town "across the bridge?" How for instance did residents decide where to build the local church? What attracted workers to settle in one mill village rather than another? How permanent or transient was the workforce? These questions for now remain unanswered. Answers to other questions about these liminal villages can be derived from what is generally known about 19th century American society. How was it resolved which town got the village post office? After the election of Andrew Jackson, the so-called spoils system determined the location of the federal post. In years that a Democrat was President, the post office was likely located in the business or home of a stalwart Democrat; when the nation had a Republican (or Whig) President, the post office was relocated to the shop of a similarly suitable partisan. Woodville's post office was established in 1853, and was closed down in 1925 (see R.I.H.S. Postal History), which provides us with some indication of the heyday for this particular mill seat. As for the taverns, their location was determined once the temperance movement began in earnest in the 1840s. If one side of the village "went dry," a grog shop would simply reopen on the other side of the village across the river, so long as liquor licenses might still be had there. Even if the town wasn't dry, town councils shared information with neighboring councils about "common drunks" who had been "posted" or banned from being sold alcohol within the town limits, so they would not simply carry on their dissipation in the next town over. In a liminal village like Woodville, the Hopkinton town clerk had only to cross the bridge to put the notice on the tavern door in Richmond to shut off the local tosspots. The aforementioned short-line railway that connected Locustville and Hope Valley to the main Providence-Stonington Railroad at Wood River Jct. passed through the village to the north of the mill seat. As this map from Jim Spavin's model railroad site indicates, a second bridge was built over the Wood River to carry the train. According to my father (who moved to the area in 1940 when he was about sixteen), he and his friends would run behind the train as it left Wood River or Hope Valley and jump on, pretending to be Depression-era "hobos" riding the rails. Many of the so-called "shoddy mills" stayed in business into late 19th and even early 20th century before succumbing to competition from the larger factories, which in turn declined with the rise of textile manufacturing in the Dixie Sunbelt. By WWII most were empty buildings. The Woodville Mill endured a few year after as a storage building for a local cloth and remnant merchant; the site has been abandoned now for decades. The larger concerns have been slowly dying too, one-by-one, over the past 30 years, killed off by cheap textiles from Mexico and China. The Charberts factory in Alton closed two years ago, leaving the textile factories in Kenyon and Bradford as the only surviving "liminal" manufactories in the area. Another view of the "big gears." A second extant "big gear." The owner's house / store / tavern, currently for sale, and the decrepit bridge over the tail race. Metal pegs that once held the door jamb fast in the doorway. The doorway, looking into the mill. The basement may have had water running directly through it when the mill was in operation. I had a friend in elementary school who lived in the old mill (then converted to an apartment) in Charlestown at Cross Mills--the water ran directly under his house, and similarly large sets of gears remained there as well. The masonry wall is still in good shape that runs north to the tail race. Mark, I just stumbled upon this post and wanted to tell you that I grew up on this property in Woodville. As far as I know, the current owners (since 1977)have never had this property up for sale. I do know that the small house just to the right of the property's drive way was for sale. 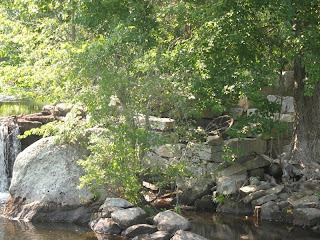 When we were kids living here, we found many medicine bottles at the mill site. The house was formerly owned by a Dr. Francis Kenyon. Back in the early days, a woman doctor was nearly unheard of. I have a "mushroom basket" with her name stenciled on the handle. Just wanted to share that bit with you!